We’d love your help. 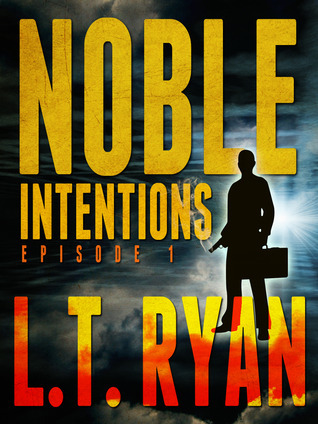 Let us know what’s wrong with this preview of Noble Intentions by L.T. Ryan. Jack Noble. Assassin for hire. Thief. Spy. Described by his associates as a man who has no feelings, passes no judgement, and feels no remorse. So why the hell did he stop to help a lost child moments before he was to meet with one of the top crime bosses on the East coast. A simple decision that now places Jack in unfamiliar territory where he has become the hunted. Noble Jack Noble. Assassin for hire. Thief. Spy. Described by his associates as a man who has no feelings, passes no judgement, and feels no remorse. So why the hell did he stop to help a lost child moments before he was to meet with one of the top crime bosses on the East coast. A simple decision that now places Jack in unfamiliar territory where he has become the hunted. Noble Intentions is a thrilling and suspenseful story of underworld crime, government secrets, and heart-pounding action. This is the first episode of Noble Intentions. It is a short novella of 15,000 words. New novella length episodes (15,000 to 20,000 words) will be released every two to three weeks. To ask other readers questions about Noble Intentions, please sign up. You can't help but like Jack. Sure, he's a hired gun with a lot of experience and little remorse, but there's just something about him. When he lets a person in, it comes with a promise of protection. Don't threaten the life of his friends or you WILL regret it. He knows what he's doing. He can find you. Anywhere. L.T. Ryan writes an action-packed novella full of suspense, humor, and snappy dialogue. The words are short, to the point, and clear. Just how Jack would like them. Who knows, maybe Rya You can't help but like Jack. Sure, he's a hired gun with a lot of experience and little remorse, but there's just something about him. When he lets a person in, it comes with a promise of protection. Don't threaten the life of his friends or you WILL regret it. He knows what he's doing. He can find you. Anywhere. Although a short story or "serial" this book was fast paced, and action packed. It hooks you in from the beginning and leaves you begging for more by the end. The reader is left anxious to buy the next in the series. Can't wait to read the next one. I like this author and this book. His mechanics of good writing are excellent. Normally I do not like a lot of characters and dual storylines, but this author's use of the same just makes the book better. Jack Noble is a white hat mercenary running black ops, and that is enough said about the meat of the book. It is his getting into dangerous situations and how he gets out of them that keeps the book alive. Jack is too cool. He does jobs for cash, but has a heart. With his partner, Bear, they get the job done. Fast read, enjoyable characters & story line. Cannot wait for the second installment. Jack Noble is pretty awesome. Lots of fight descriptions and action. "A true Serial killer thriller"
A hard-hitting slice of action for Jack Noble's first outing. Sadly I'll never know how things turn out as it wasn't different enough from a whole raft of this kind of thriller on offer to make me want to read Episode 2. If you are a fan of the genre and happy to get your story in Episodes (like watching a TV series week by week), then it will suit you down to the ground. I love this mini series. All 5 of them should have been just one book instead. I love how action packed they are and it is hard to put them down. There does not seem to be a good place to put it down when necessary. The plot is wonderful and the characters are very well written. Read this within the book episode 1-5 - using this book to count the book - The Recruit. The Recruit - short story of Jack Nobles beginnings at boot camp. I loved this book... I was so hooked that I continued to read the rest of the series. Jack Noble is amazing, and one of my favorite fictional characters! Great writing. I really could not put it down. Excellent book. This book is filled with lots of action, that will keep you turning the page just to see what is going to happen next. Very well written and I look forward to reading the next series. L.T. Ryan is always a great read.